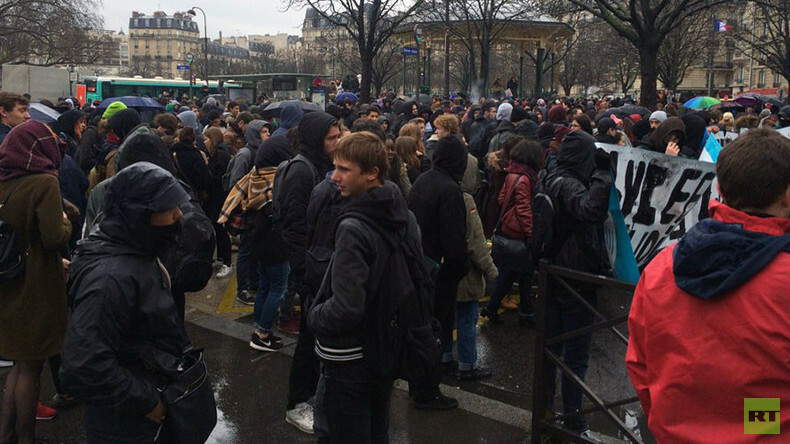 Scores of students have taken to the streets of Paris to protest unpopular labor reforms recently proposed by the French government. Several firecrackers have been reportedly fired from the crowd of demonstrators. A heavy police presence was reported in the center of the French capital. RT’s Anastasia Churkina has been reporting on the protest via Periscope. The protesters have attempted to smash an ATM , Churkina reports. The crowds were chanting “High schools, universities, workers, unemployed unite!” France 24 reported. The students are protesting against labor law reforms proposed by Labor Minister Myriam El Khomri. The French government is desperately trying to battle high unemployment in the country, and has suggested cutting overtime pay for work beyond 35 hours. Also according to the proposed reforms, employers would pay only 10 percent of overtime bonus, instead of the current 25 percent. “We must also give companies the opportunity to recruit more, to give job security to young people throughout their lives, and to provide flexibility for companies,” he said. The protests were partially organized by a Facebook community called ‘Loi travail : non, merci’ (Labor reform: No, thanks). Arguing that the reforms concern all French citizens, the group has started a petition which has so far been signed by over 1 million people. Rallies are also taking place in other cities across France, including Rennes, Montpellier and Toulouse. “We are employees of the future,” one Twitter user wrote, adding a photo of the demonstration in Paris. Protesters in southern city of Toulouse have used firecrackers in their demonstration.